I awoke with thoughts of myself again this morning. They were thoughts driven by my compulsion to want to make a difference in the confusion of Terrorism. I yearned to have o rise above my own indifference to the world and life...and cling to something fragile...some belief that my Voice heard above the cacophony of words and sounds and pictures cluttering people’s minds about the tragedy of September 11, 2001 when America and the world tasted the fangs of the Beast of Terror in a fierce, cruel way. I ask you to help me remember America is only one of many tragic sites of Terrorism in the world. Help me be cautious not to believe that the Unified States is the only or most important place on the face of the earth where Terror destroys innocence, or bloodies the soul of a nation, a region, a town, a family, a citizen, a helpless child. Help guide my thoughts to the reality almost every country faces some upheaval of terror. Not long ago thousands of black bodies floated down rivers in Africa as Terrorists raped, pillaged and plundered the innocent. Why didn’t I leap up out of my complacent chair then and create an armband with Semper Vigilantes for them? Then, not long afterwards the white-skinned people of Bosnia were brutalized, and then the Kurds were driven like sheep to “safe zones” where they wouldn’t be killed, tortured. Where was my alarm for the innocent then? Today, terrorist in Palestine and Jerusalem attack one another over both land and principle. Not too long ago the Irish and Protestants were bombing and killing one another in Dublin. Where was my indignation then? In Guatemala and El Salvador peasants are run off their land, plastic bags slipped over their heads, beaten with rubber hoses, killed and buried in unmarked graves. I didn’t raise a single finger then, did I? In China baby girls are killed to reduce the population. I haven’t said a word of protest about the terror of killing new-born life--the world’s most precious asset. Why now? Why think I have the right to protest Terrorism today when I ignored it before? Help me not forget my former complacency. Let it stand as a reminder to me of my own ignorance, my own self-centeredness. 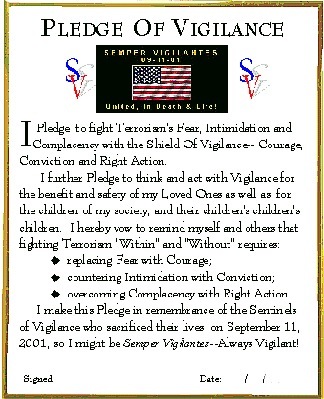 Let my Voice, my words, my thoughts not focus just on the 300 million Americans who need to wear the Semper Vigilantes symbol of "vigilance," but also the other 4.7 billion people, the other 97% of the world who suffer Terrorism daily, in one form or another. I realize it was easy to turn a cheek when someone else was under attack. I know when the neighbors scream it is easy to question whether “you should get involved.” But when the terror attacks your front room, threatens your wife, your children, your grandchildren, you have no choice but to act. Perhaps the great message of human compassion resulting from the Terror of September 11 is a wake-up call to all Americans like myself to pay closer heed to the Terror of the less privileged, the less advanced nations whose pains and problems barely make our news. I am starting to feel the kinship between all those who suffer what America has suffered. Before the holocaust of September 11, the victims of those countries weren’t my brothers and sisters, my parents, my grandparents, my children, my grandchildren. Slowly, I am beginning to realize they are. I am thinking about them as my lofty goals of helping “Americans fight Terrorism,” are forced to understand that “Terrorism” is not an American problem. It is a world problem. Semper Vigilantes belongs to the world, not just America. Perhaps now, when I read a magazine or newspaper instead of skipping over some story about the pain and anguish of a third-world citizenry suffering from the Terror of war, or Terror of despotism, or the Terror of hunger, I will stop and ask myself: "Would I skip over the article if it was about the starving down the street, about the ravages of families a few blocks away?" I ask you to keep me grounded in purpose, to help me not single out one nation or one people in my writings at the expense of so many others. Hopefully, Americans will find that no longer are they isolated from concern or commitment to their brothers and sisters of Terrorism. Perhaps they will feel the kinship I am starting to feel. Keep your humble light shined on my thoughts and let them glow in my words, so I don’t forget that Semper Vigilantes belongs to the world, not just America. Go To: "Seeking Vigilance With Purpose"